A twenty-cent piece was certainly not a new idea. First proposed by Thomas Jefferson in 1783 to be part of our decimal system of coinage, the idea was abandoned in favor of the quarter dollar during deliberations for the Mint Act of 1792. The quarter more closely approximated the “two-bits” of the Spanish eight reales pieces then in widespread use. Proposed again in 1806, the denomination faced little opposition itself, but the legislation was defeated for reasons having to do with other parts of the bill. Finally, in February of 1874 Nevada Senator John Percival Jones, having somewhat dubious motives, introduced a bill to make the denomination a reality. The Senator claimed to believe that this coin, one that the Carson City Mint could produce, would solve the problem of the shortage of small change, particularly in the West. The Mint Act of 1873 had abolished the silver three-cent piece, half dime and dollar, but without giving the San Francisco or Carson City Mints authority to produce minor coins. With the half dime rapidly disappearing from circulation, it was becoming increasingly difficult to get the correct change of a quarter. In 1874 hundreds of common items were priced at ten cents, and those paying with a quarter would often be shortchanged by receiving a dime or a Spanish bit, worth just 12-1/2 cents. Obviously, producing cents and nickels at the western mints would have been the best solution, but for some reason this option was ignored. Apparently, with Senator Jones’ influence, consideration was given to the owners of the Comstock Lode silver mines, who had lost much of the demand for their output because of the 1873 Mint Act. Possibly for similar reasons, Mint Director Henry Linderman supported the bill, and Congress went along. Unquestionably a political answer to the problem, the bill was signed into law by President Grant on March 3, 1875. Linderman, a collector of pattern coins himself, ordered Philadelphia Mint Superintendent James Pollock to obtain designs and submit patterns for approval. The first designs resembled the quarter dollar too closely, so several other versions were submitted. Treasury Department policy, however, favored complete uniformity of design within a series of coins of the same metal, so the final design approved by Linderman ended up being the most similar to the quarter and therefore most confusing to the public. The obverse of the new coin bore Chief Engraver William Barber’s low relief copy of the old Sully-Gobrecht-Hughes design, featuring Liberty seated on a rock, holding a staff topped with a Liberty cap. She is surrounded by thirteen stars, with the date below. The reverse bears Barber’s eagle from the Trade dollar, with the inscriptions UNITED STATES OF AMERICA and TWENTY CENTS around the periphery. The coin was made with a plain edge, supposedly to make it easier for the illiterate to distinguish it from the quarter. As it turned out, confusion with the quarter was widespread. The public’s enormous dislike for the new coin signaled an early end to the denomination. Mintage commenced in 1875, but by the following year a bill was introduced repealing authorization, though it wasn’t passed until May of 1878. In this four year period, only eight different date-and-mint combinations were made. The bulk of the production came from San Francisco (mintmark S), which struck 1,155,000 coins in 1875, the only year it produced the denomination. Carson City (CC) struck 133,290 pieces in 1875 and 10,000 in 1876. Philadelphia (no mintmark) minted the fewest coins, with 39,700 in 1875 and 15,900 in 1876. (The mintmark can be found on the reverse below the eagle). Although business strikes were made just in 1875 and 1876, proofs saw production for two additional years, and a total of 5,000 were made before the coin’s demise in 1878. Due to the twenty-cent piece’s brief life, only one type was issued. Except for having smaller stars, its obverse was almost identical in appearance to the Seated Liberty design on the other silver coins. In addition, LIBERTY is in raised relief on this design, like the 1836 Gobrecht Dollar and unlike the recessed or incuse LIBERTY on the other Seated coins. Wear shows first on the head, breast and knee of Liberty. On circulated pieces, LIBERTY will begin to wear along with the other devices mentioned. On the reverse, the initial wear points are the eagle’s breast and the top of its wings. Due to problems with striking pressure, 1875-CC is often found with an incomplete eagle’s wing, even on uncirculated specimens. While the denomination was short lived, it contains one the most famous rarities in United States coins, the 1876-CC. 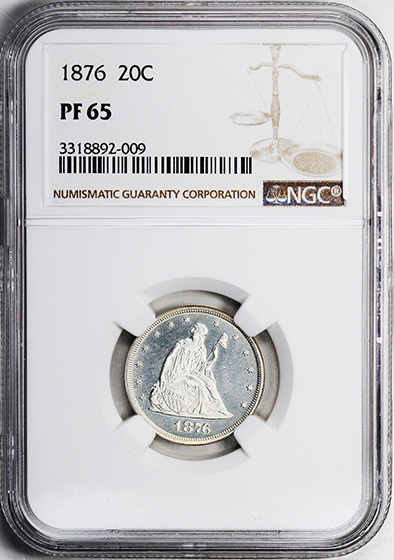 Usually appearing only when celebrated collections are sold, this date is truly one of the icons of American numismatics. Mint records show that when the order came down to melt all the twenty-cent pieces as obsolete, 12,359 pieces were on hand in Carson City, the bulk of which were the 10,000 1876 coins. Obviously, most were destroyed, as probably no more than 18 examples of this date exist today, and the majority of those are uncirculated. Counterfeits, other than the most rudimentary fakes, are rarely encountered, as all genuine 1876-CCs will show doubling on LIBERTY, and this effectively precludes adding a mintmark or muling a reverse to an 1876 Philadelphia piece. Another rarity, though not quite as well known, is the 1875-S branch mint proof. Confirmed to exist by B. Max Mehl in the 1930s, only about a half dozen are known today. 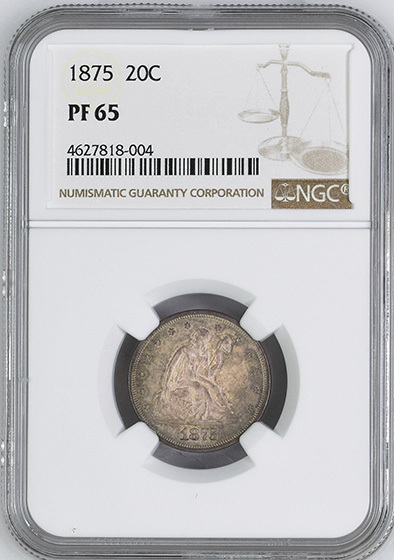 It was apparently struck as a presentation piece signifying the first coins of this denomination to be coined in San Francisco. Of the other dates in the series, most are readily available, even in mint state, with 1875-S most often encountered. The four Philadelphia proofs, although varying widely in mintage from 2,790 for 1875 to 350 for 1877, are seen with equal frequency. True Gems are becoming more elusive, however, as condition conscious type collectors have absorbed much of the supply. Much more popular today with collectors than it was with the public when first issued, the series can be assembled (except for 1876-CC) for a relatively modest investment of money and time.